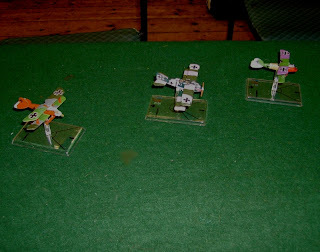 As the title suggests, we did Wings of War (sorry - Glory!) at the club yesterday! We decided, for a change, to use German aircraft-- 2 Albatrosses and a Roland. In the first move the Germans went straight forward.. I had my Albatross reverse course to split the enemy. The unimpressed British went on for the main group. Seeing the failure of my 'cunning plan' - I decided to attack! The Nieuport and a camel went for me, the other 2 camels went for the Roland. I turned to avoid my attackers, and headed back for the main battle leaving my pursuers (thankfully!) --far behind! The Rolands tail gunner firing innefectually. I was now ready to join in! Unfortunately, the wrong footed camel and Nieuport were closing on me! The Roland was using his massive angles of fire to great effect! The other Albatross joined in with his brace of Spandaus. A Camel got a snap shot on me! We all manoeuvred out of these interlocking fire arcs! My next turn, I got a long shot at a Camel. The other Camel and the Nieuport now joined in. We were outnumbered! 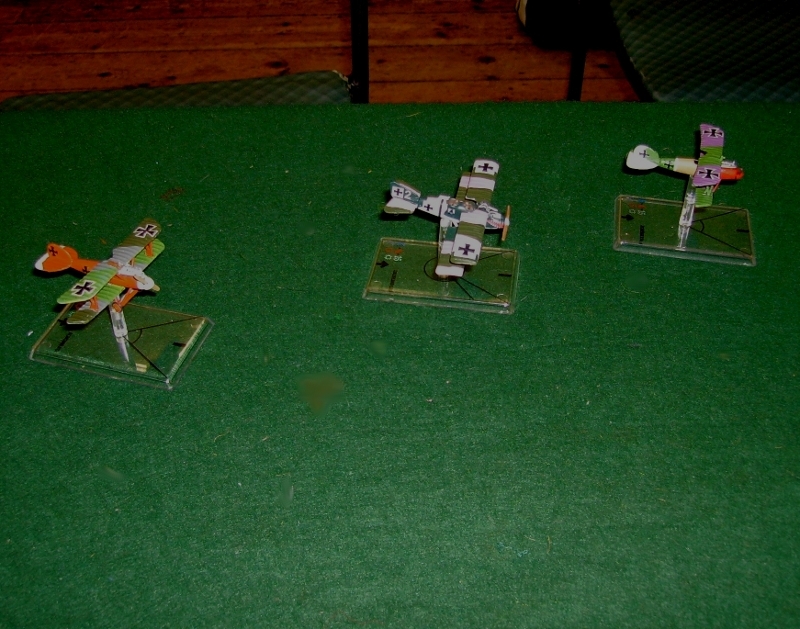 The Nieuports first shot was a BANG, my pilot fell dead! It was now 2:1 against our forces! The Nieuport, moving like an angry lawnmower ploughed on.. The Roland got the better of his encounter with Ball! The other Albatross got hit. The Roland hit a Camel, the remaining Albatross damaged the Nieuport. ..before swinging in to help the Roland down a Camel! At this point the Luftstreitkräfte decided to leave the battle, the odds were too great to face safely! It was a good game, even if the Solo system did win!!! Today, we did a colonial game with a difference! Many people see the colonial expansion period of European history as Spanish, Portugese, French and British. We decided to play a game leading African tribesmen against a company of the detested Force Publique. The scenario envisioned a company of Belgians moving on a punitive raid against the chief settlement of a Congalese tribe. We had a scratch force including allies, to try and stop them. The Belgians would be run by our rules solo system. The Battlefield- the ford where the ambush was set. La Force Publique advanced toward the ford. The first section spread out to clear the crossing point. At the column rear, the troopers were cautiously looking around. Around them, unseen, the tribes gathered! On the far side of the ford, more warriors. Things looked black for the Belgians! One of the chiefs nephews kept the eager warriors from shooting too soon. 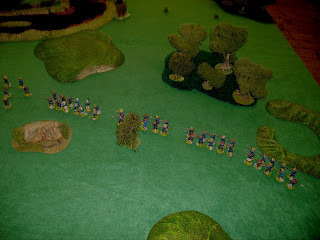 The Belgians saw some warriors across the ford and fired! On their right, more warriors moved into attack positions. 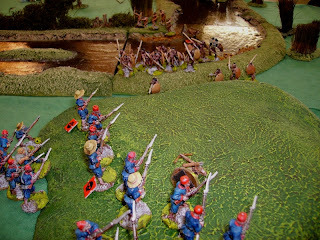 ..and moved some of his men towards the ford. Finally, the warriors sprung their trap. The rest of the warriors advanced to the attack. 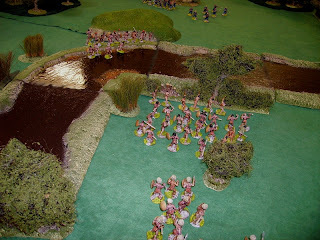 The Belgians, surprised fell back to form line and fire..
Warriors appeared on the Belgian flank. ..and across the ford in increasing numbers. Most of the Belgians faced the flank attack. The rest tried to hold the ford. The assault on the ford began! On the flank, the Belgians ceased firing and charged the warriors as they appeared! After a hard fight, the natives were driven back from the hill. ..and after a desperate fight one unit broke. The Belgians pursued the retreating natives. Back at the ford, more warriors crossed the ford, after a first attack fell back with heavy losses from accurate Belgian fire. These reserves met the same fate. On the Force Publiques left flank, the last reserves of the natives attacked. A small group of Belgians at the ford got isolated, but put up a spirited defence. The main Belgian body destroyed the native attacks with disciplined volleys. The Chiefs son, seeing the mounting losses, called off the ambush to preserve lives. The natives lost about 40 dead and wounded, as opposed to 5 or 6 Belgians, despite our best efforts, the colonial powers were victorious!